The AKG K702 has been marketed as reference headphones for listening, mixing and mastering. Assembled and tested in Austria, it promises quality build and finish. Retailing at $409, it looks luxurious and professional, befitting its studio pedigree. How it performs sonically will be delved into. The K702 is almost entirely made out of plastic. The result is a pair of headphones weighing 235g despite its size. There’s no reason to get snobby about plastic; the construction is solid and can withstand flexing. Short of intentionally snapping the band into half, the studio headphone can live a life of constant action. Fragile, they are not. 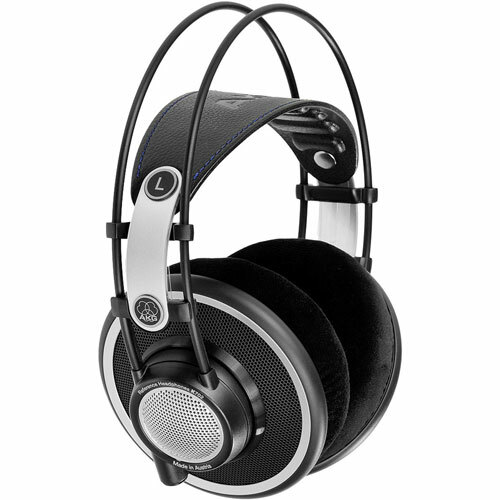 Most studio headphones sport space-age looks – think silver accents and mesh metal – and the K702 is no different. The congruity of the design is very pleasing to the eye, yet might not be sleek enough for outside wear. You’ll want something a little simpler and smaller for that. The only visible difference it has with its lesser-priced brethren is the color. Dark blue replaced K701’s white, making dirt less visible on the K702. It has also been thoughtfully equipped with visible L and R indicators, so you don’t have to feel for them like a man in the dark. The plush-looking earcups are very, very comfortable and the grip exerted by the padded leather band is just right. You won’t feel as if your head is trapped between the pincers of an angry crab, even if your head is bigger than average. However, the ridges from where the band meets the cups may make their presence felt, especially if you don’t have a head full of hair. If your locks are not up to the task of cushioning your head from the pressure points, soreness will come very quickly. It’s always advisable to try one on first before buying, or hang on to the box and warranty if you can’t. The size of the cups may be a little on the gargantuan side, but they enclose your ears like upended bowls on a table – thoroughly. This allows for the total surround sound that will be discussed later. Unfortunately, a carrying case or stand has not been included in the set, seeing as it’s a studio pair. It would be nice to have one all the same, though, to protect the K702’s skinny bits while on the move. Also, unlike the K701, the cable, which connects to the left cup via a locking, three-pin connector, is detachable. A must, given that studio headphones are used more vigorously than consumer ones. 3 meters of it should be long enough to not hinder you from prancing about within the vicinity. The stereo plug is a gold-plated 3.5mm one, but a screw-on 6.3 mm adaptor is included too. Audio nirvana is only a possibility with a select few headphones, but the K702 is good enough to be shortlisted. A word that could describe its sound profile is ‘smooth’. No matter how loud you crank it up, the flat-wire voice coils keep the music distortion-free. It’s analytical and correct, revealing details that would usually pass by unnoticed by lesser apparatuses. The midrange is airy and vocals sound delightfully lifelike. The treble is decisive, breaking off with barely discernible sibilance. In this regard it’s similar to the K701. The K702 may come off sounding a little too analytical and cold at times. While the bass is adequate and well-controlled, some songs benefit from a little warmth. Comparison to the $1400 Sennheiser HD800 will be unfair, so the K702 is best juxtaposed with its closest contender, Grado RS1 . The latter’s bass hits harder, lending a more dynamic feel to the sound. But then again, the RS1 has nothing over the K702 in terms of soundstage. AKG made a promise that they most certainly kept: out-of-the-head imaging. The way the sound encompasses you is nothing short of phenomenal. Thanks to its open design, each instrument seems to originate from points all around, rather than blast right outside your eardrums. When tested with classical pieces (like Carmina Burana: O Fortuna), the tenor of the singers, violins and drums are cleanly separated, but all come together in a beautifully layered arrangement. Gaming will also be a whole new, immersive experience. First-person shooter games like Halo 4 are at their best here. One downside is the nearly non-existent sound insulation. Other commuters won’t appreciate the opportunity to be able to listen to your songs when they sit next to you. Nonetheless, that won’t matter much if you purchase it to use indoors. The K702 also require a considerable burn-in period, which is 100 hours and more, before they start opening up. One thing you can do is to plug them in and play songs on repeat. At the end of the week, they should start living up to their true potential. The K702 is best coupled with high quality recordings and a good headphone amp. Nothing less than the best should power them, since they reflect what you put in them accurately. They still sound amazing plugged to an iPod, but more power will do them justice. If you have the K701, the minor differences do not warrant an upgrade. The AKG K702 is a great pair of headphones; clear and smooth sound, comfortable fit, and phenomenal imaging. However, it’s a strictly non-portable studio pair, so if you’re looking for on-the-go great music, you’ll have to look elsewhere. If rock or other bass-heavy genres is your thing, pick Grado RS1 for a more dynamic sound and deeper bass. If not, the AKG K702 is an insane bargain you shouldn’t miss.